Nolan Desmond, 7 months, is “happy as can be,” say his parents, Matt Desmond and Brittany Bateman. Nolan is undergoing treatment at Massachusetts General Hospital for eye cancer. 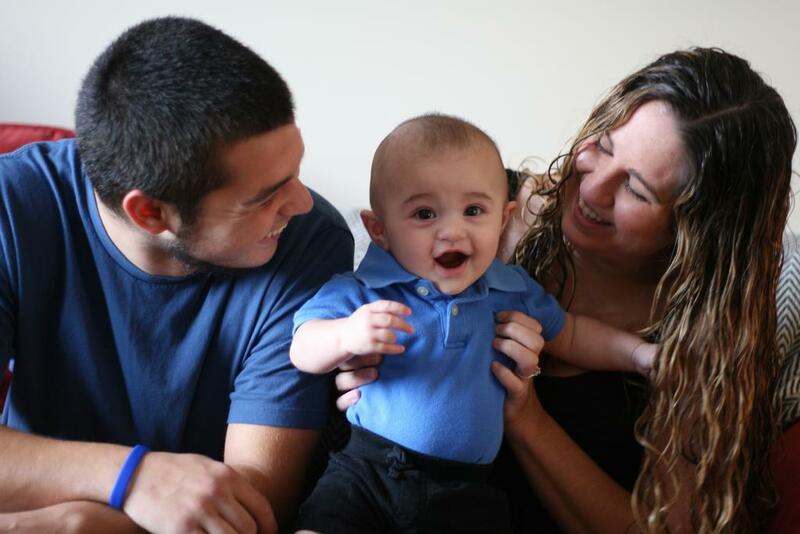 Windham firms are raising money for a couple whose 7-month-old is being treated for cancer. Local businesses are rallying to raise money for a Windham baby diagnosed with eye cancer, and his parents are pointing to the effort as an example of the strength of Windham’s community. Seven-month-old Nolan Desmond started chemotherapy at Massachusetts General Hospital in Boston this week to remove two large tumors from behind both his eyes. His parents are lifelong residents of Windham and graduates of Windham High School: Brittany Bateman in 2010, Matt Desmond the following year. Bateman said Nolan’s condition was first recognized at his 6-month check up. Shining a light into the baby’s eyes, the doctor saw a white reflection that can indicate tumors. The family was sent to an opthamologist in Portland, who gave the prognosis – tumors in both eyes. The findings were confirmed by an expert in Boston three weeks ago, who said Nolan has retinoblastoma, a cancer that forms on the retina (the back of the eye). Nolan had one large tumor and three small tumors in his left eye, and a large and small tumor in his right eye.The smallest tumors were frozen off with lasers, and the two remaining tumors will require six months of chemotherapy treatment. Bateman said Nolan’s left eye is significantly worse than his right, although it’s not evident to look at him. Doctors have said Nolan has poor vision in his left eye, but they believe the right eye will be OK. Although doctors initially disagreed about whether they would be able to save Nolan’s eye, a recent prognosis said the eye will not need to be removed for treatment. The family’s recent trip to Boston was their fifth in the past few weeks. This time they’ve stayed at the hospital, but on other occasions they’ve had to stay in a hotel, Matt Desmond said. The cost can be up to several hundred dollars every trip. Now that chemo has started, they’ll be making the trip twice each month, one for chemotherapy and the second for a check-up. Shortly after Nolan was diagnosed in Boston, his uncle set up a gofundme fundraising page online to raise money to offset the family’s expenses. More than $12,000 has been raised since Aug. 11. The story was picked up by a local TV station, which is how John Scott, of Scott’s Disposal Service in Windham, heard about Nolan and his condition. Scott started a bottle drive for the family. Through the end of September, returnables marked in Matt Desmond’s name and delivered to 23 Vista Drive will be donated to the Desmond family. Patmans Redemption Center and Agency Liquor Store at 95 Tandberg Trail, just across the street from where Matt Desmond grew up in Windham, has also agreed to take bottles for the drive. Other local businesses are on board, too. Four Bridgton restaurants and Buck’s Naked BBQ in Windham have agreed to donate their bottles to the family. Desmond works as a distributor for Nappi Distributors. Bateman worked as a waitress at the Cracker Barrel in South Portland, but is not working while Nolan is undergoing treatment. “I have to be out of work (during Nolan’s chemotherapy) because we have to isolate him from everything and everyone. His immune system will be extremely low,” she said. Bateman said the family won’t be able to have visitors at their house, and if they do, Nolan will have to stay in another room. Nolan Desmond, 7 months, plays in his favorite chair at his Windham home. Bottles to benefit the Desmond family are being accepted through Scott’s Disposal Service at 23 Vista Dr. in Windham and at Patmans Redemption Center at 95 Tandberg Trail. To donate directly to the Desmond family, visit their gofundme page.